Private emails between Texas Speaker of the House Joe Straus staff/leaders reveal Straus's profanity-laden disdain for Texas Conservatives. These emails were revealed on RedState.com. This is TEXAS for crying out loud! How is it possible that we have a speaker who hates conservatives? These emails that have been revealed should not come as a surprise to anyone because Straus already has a proven record of attacking Conservatives, hurting them in redistricting, campaigning against them, and even giving money to Democrats to beat Republicans. Straus is no conservative leader and should NOT be the leader of the Republican majority Texas House of Representatives. The only reason Straus is leader is because he was elected leader when the house was split between Republicans and Democrats and all Straus had to do was get a few liberal Republicans to join with all the Democrats to elect him as the Speaker. Once he became speaker he was able to hold on to the power by threatening any State Rep who opposed him by hurting them in redistricting and not putting them on important committees. Not to mention Straus has tons of money that he uses to pay off his supporters in races against conservatives who did not support him for Speaker. It is time to OUST STRAUS! The last time someone ran against Joe Straus for Speaker of the House, it was a last minute effort to remove Straus from power and therefore was not able to gain the steam it needed before the Speaker Election. This go-around is different though because State Rep Bryan Hughes has come out VERY EARLY and has announced he is challenging Joe Straus for Speaker. This will give the Conservatives and Tea Party groups in Texas the time needed to mount a campaign to defeat Straus. This will give them time to put pressure on their State Reps to vote against Straus. Hopefully, articles like this that reveal how Straus is waging war against Conservatives will help keep the momentum going and be the proof needed to OUST STRAUS! “These e-mails from the redistricting process shed new light on just how dismissive the Straus team was of Republican Party and conservative efforts to draw more fair districts – and should serve as a warning bell to the new House that it is time for Straus to go.” RedState has uncovered never-before-seen, profanity-laden e-mails between senior staff and legislative lieutenants of Texas’ liberal GOP House Speaker Joe Straus demonstrating disrespect for, and even hostility towards, grassroots activists and conservative lawmakers. Tea party activists are called “idiots,” allies of U.S. Rep. Joe Barton are called “mother f***ers,” and decorated U.S. Marine and State Rep. Van Taylor is dismissed as “stupid,” by a top Straus political strategist. Despite efforts by grassroots organizations, new media writers and others, most of the coordinated efforts against conservatives by Straus and his allies regarding Texas redistricting have been hidden from view. Speaker Straus has exerted various privileges and exemptions to keep the public from seeing emails or any other evidence of their activities. In fact, Texas Attorney General Greg Abbott has most or all the emails because of the re-districting litigation, but has not released them at the apparent request of his client, the Speaker. However, in a batch of emails RedState has managed to get hold of (through other sources), it has become clear that Straus’ key strategists were openly hostile to conservatives. In particular, his top confidant Gordon Johnson (a Straus horseracing partner and former lobbyist) was clearly running the show — not the speaker’s chief of staff or other official office members. But let’s be clear, this fits a pattern. Some readers may recall a post I wrote a few months back in the heat of the battle between Ted Cruz and David Dewhurst. In that, a friend in Austin detailed a conversation overheard at a coffee shop between a Dewhurst and a Straus staffer. The conversation was similarly dripping with disdain for the Tea Party and all things conservative. Now, as a quick reminder, Joe Straus was elected Speaker by Texas House Democrats and a gang of 11 liberal Republicans back in 2009. I will get into Straus’s record again in a later post, but there are a host of reasons Democrats backed him – not the least of which is a questionable record on life, a penchant for “new revenue,” and a track record of obstructing the will of conservatives. 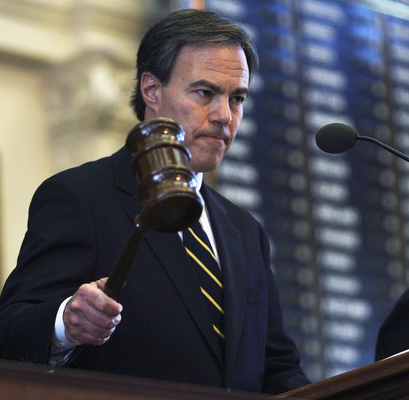 In late 2010, before the start of the legislative session, State Rep. Bryan Hughes of Mineola (now the conservative opposition candidate for speaker) came forward with charges that he was told conservative lawmakers would be punished if they opposed Mr. Straus’ re-election. He specifically testified under oath that it was clear Reps. Erwin Cain and Dan Flynn would be punished. The investigating committee (appointed by Straus) took no action, despite the charges constituting a breach of law. When the re-districting process concluded, Messers. Cain and Flynn were indeed paired. Meanwhile, conservative stalwarts Wayne Christian and Jim Landtroop were drawn out of 80 percent of their districts. The Straus team therefore successfully eliminated three of four conservative opponents, replacing them with representatives more compliant to Straus. Of course, because the grassroots conservatives understood what was happening, these three were the only Straus opponents to lose re-election. Meanwhile, a number of Straus supporters — including five committee chairs — lost re-election, and still other Straus allies chose to retire rather than be challenged in their primaries. But the looming question is whether the ongoing threats by Straus will lock down the race for speaker yet again. So we have a Texas Obama in the House? hmmm Well, he needs to go. I am really sick of these evil people and what they are doing to America, evil is sick and of the devil. God says to hate evil and God will destroy the evil people His way. But we need to do our part and let people know that are not paying attention. Discusted but fired up.